Babblings of a Mommy: I Dream Of A Neon Summer. I Dream Of A Neon Summer. With hot neon pieces like these--who wouldn't want to turn up the heat with a little color blocking this summer? Go ahead, be bold. Add a little spice to your wardrobe--and make this summer even more caliente! Awesome picks! The yellow dress and orange wedges are my favorite. I just love the bright colors. I am so ready for it to stop snowing here so I can breakout my summer clothes. 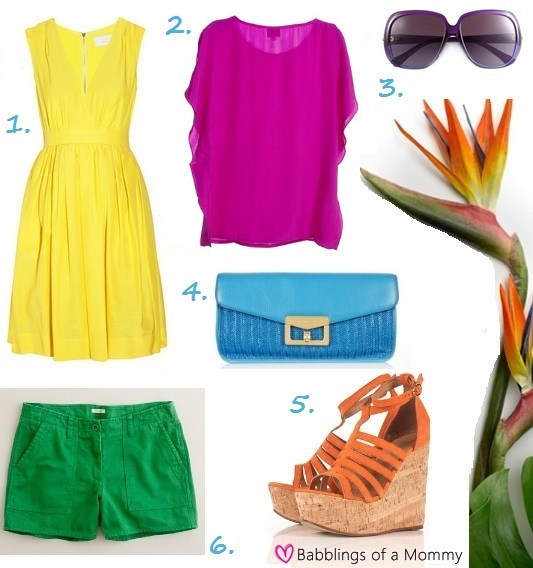 great picks..I'm into the bright colors as well. I really love the fuchsia shirt..very pretty! !